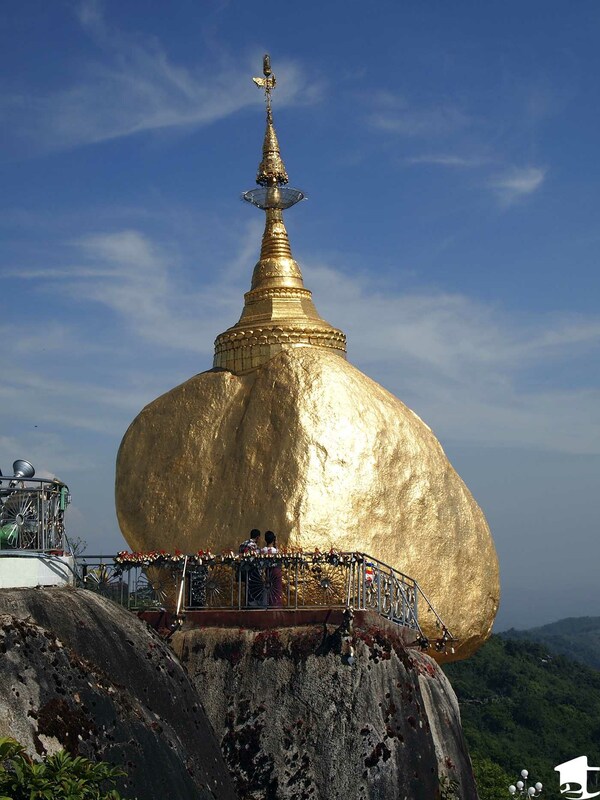 The Golden Rock is one of the most holy Buddhist sites in Myanmar and truly an amazing sight. However, I found the journey to the top of Mt Kyaiktiyo to be taxing on both the wallet and body. That is not to say I do not recommend visiting the rock, but I do so with extreme caution. From the nearby town of Kinpun, it is a minimum half-day commitment, and depending on the time you want to arrive or leave, this could easily become a full-day excursion. We elected to stay in Kinpun for one night, as it is the base camp for Mt Kyaiktiyo (which holds the precariously balanced Golden Rock) and we had the time to commit to an overnight stay. For those on a more frantic schedule, it may be possible to make this a day trip from Yangon, or even a stopover en route to another town, but with buses running infrequently, this is not recommended. There are a few towns in the area, but Kinpun seemed to be the best acclimated for tourists and pilgrims traveling to the top of the mountain. We found prices to be more reasonable since it had a larger selection of restaurants and places to stay. For $18USD, Pann Myo Thu Inn ended up being a decent one-night choice. As with most of our accommodations, we booked via telephone in advance, informing them of the bus we were taking. A hotel staff member met us at the bus stop, which was a nice surprise. The room ended up being tiny and impersonal, but the price included A/C (when the power was running, which was not often) and breakfast (very, very basic, but filling). The staff recommended an excellent restaurant (they had stellar tea leaf and ginger salads) and helped us with getting to the Golden Rock. For those looking for adventure, it is possible to walk from Kinpun to Mt Kyaiktiyo, but the seven miles separating the two can be grueling. According to hotel staff, this hike takes 6-7 hours depending on how hard you push yourself, while going downhill is about half that. We were advised against hiking up, as the temperature would skyrocket during the day (at least when we were there in late April). Climbing up the mountain basically rules out seeing the sunrise, although if you scale it, you could stick around until sunset, which is supposed to be equally impressive. If you are shooting for a sunrise viewing, you must get to the bus station very early (around 5am), as open-air trucks (which hold about 35-40 people) leave only when they fill up. Even if you get there early enough, you are not guaranteed a set time for departure, which may cause you to miss sunrise at the Golden Rock. We got into Kinpun in the morning but our hotel’s staff was already herding us to the bus station to go up (at the time, we hurried because we were under the impression that the trucks ran on a schedule). The cost of a “seat” to the top is 2,500 kyats (around $3USD), as 1,500 kyats (around $2USD) will only get you halfway up. Do not make the mistake of only paying 1,500 kyats or you will get summarily tossed off at the midway point and have to hike the rest (we ran into one exhausted foreigner who had made the mistake of only paying the half fare and had to hike with a fully loaded backpack. Talk about bad luck.). One thing we never understood about Myanmar (and to this day still do not) is why cash is not collected at the beginning or end of the ride, but always at some inefficient point, usually during the middle of the journey. It is as though the employees wait until the ferry, bus or vehicle has reached its bursting point, and then they wade through the crowd to collect money. The packed open-air bus ride to remember. The full price bought us a 45-minute ride to remember and bruises that a couple weeks later are finally disappearing. Your allocated sitting spot would probably best fit a kindergartener, and the space for your legs is only comfortable for small children. Tara even felt a little cramped, and I thought I had accidentally joined Cirque du Soilel. The ride ended up being one of the best, worst experiences in Myanmar. The driving had us jostling off our seats (we ended getting the last two seats on the truck and every bounce felt like I was going to be tossed from a bucking bronco. Eight seconds, cowboys? Try 45 minutes!). To make matters worse, a child projectile vomited on the guy in front of him near us. Apparently this is common enough that it might be a good idea to bring a change of clothes. Seriously. As a whole, the ride can only be described as utter and total chaos. The road was filled with sharp inclines, monstrous potholes and enough swerving to make an Indian driver blush. Scary, but we treated it like rollercoaster. After all, they could not keep the ride going if they kept killing passengers. Right? If this ride does not seem like your cup of tea, we heard you could make a reservation and have a seat in the cab of the truck. This will double the cost of the ride up and back, but these seats are highly coveted and your chances of landing them as a foreigners are slim. (You might have to fight a monk to get it.) It is worth talking to your guesthouse in advance, as they might be able to secure one for you. However, we were in it to win it and when, finally, the truck pulled to a stop at the top of the mountain we scrambled off. Solid ground never seemed so sweet. The truck drops you off a 10-minute walk from the rock. There is only one path, so follow the crowd. Along the way you will pass a foreign visitor ticket office (the current price is $6USD in crisp condition) that also has a public toilet. Another five minutes of walking will take you to the bottom of stairs that lead to the temple that surrounds the Golden Rock. Here, you must take off your shoes to enter the temple area. If you read our other posts about Myanmar, you know that when we kick off our footwear and walk around barefoot, it can only be the hottest time of day (the trend continues here). It’s about 1pm, and by now the soles of our feet are baking into a nice golden brown on the steaming hot tiles surrounding the temple. With the tiles being indiscriminatingly hot (you would think maybe the white ones are cooler than the darker ones, but I assure you there is no rhyme or reason in their temperature), you may see others running through the temple to avoid scorching their bare feet. There were signs at the temple’s entrance warning that anyone wearing shorts, short skirts or revealing tops would not be allowed to enter, but I spied a couple tourists violating this rule and they were floating around without any problems. Unfortunately, this ended up being the second location we visited where women are barred from entering certain areas. In the case of the Golden Rock, men are allowed to go directly up to the Rock, to either pray, take pictures of it, apply gold leaf to its surface, etc. However, women are relegated to a walkway next to and underneath it. In addition to affixing squares of gold leaf on the Rock, bells are also for sale — people attach them to surrounding fencing either in memoriam or as a commitment to a current loved one. With the mountain’s constant wind, these bells act as a symphony forever playing in the breeze. There is a tiled temple area where pilgrims can be found praying or meditating, but for non-spiritual visitors, as a whole, there is not much to see or do within the temple area except admire the Rock. Many families were picnicking in the temple, having brought mats, blankets and food. We cut through the temple to find a small village on the other side, which seemed to cater more to pilgrims versus sightseeing visitors. Prices for accommodations on Mt Kyaiktiyo are roughly triple the rates in Kinpun, but staying at the top affords you the only real opportunity to watch the sunrise and sunset. While we were wandering around, we found some locals playing chinlon (hacky sack with a rattan ball) and were pulled in to join them. We played on a startling steep set of stairs, and the only good news is that I survived (Video of this spectacle). Probably all told, we spent a couple hours on the top of the mountain looking around. When we decided to leave, we returned to where the truck dropped us off only to wait an hour for the truck to fill up. If the truck does not look full, it is best to wait outside. We made the mistake of jumping in, which doubled the amount of time we were cramped (waiting for the truck to fill and then the actual journey down the mountain). On the return ride, there is no midway stop, so the cost is 2,500 kyats. However, our truck (and probably all trucks) stopped multiple times in order to wait for ascending traffic to clear, as there are several areas that are only wide enough for one vehicle. This inflates the length of the downhill ride to be the same as the drive up (about 45 minutes). All in all, this is the rare experience in Myanmar I would recommend skipping. 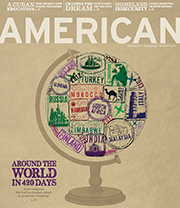 There are far more rewarding cities and locations to visit. Bago, Mawlamyine and Hpa-an area all nearby and have numerous interesting activities and sights. Even for those taking full advantage of a 28-day visa, this is 24+ hours that are better spent elsewhere in Myanmar. 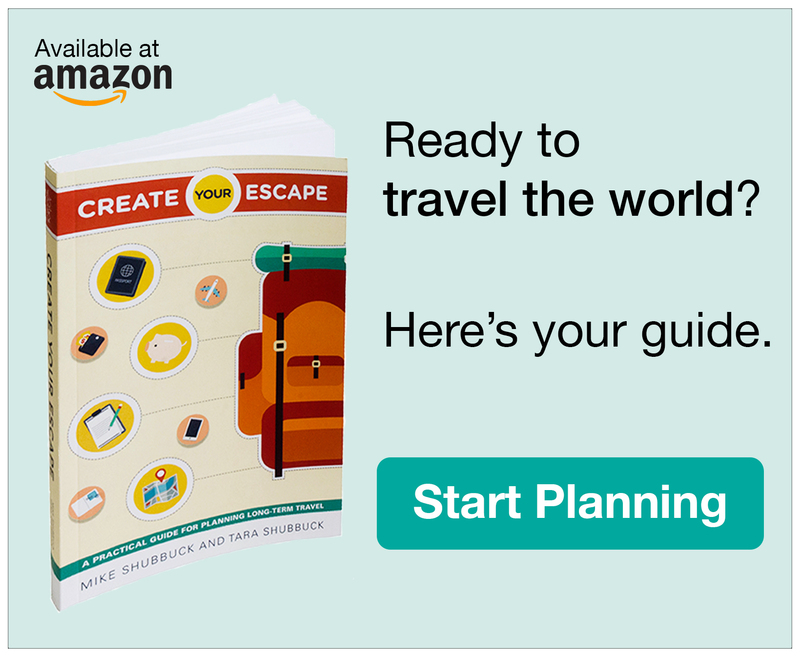 Wow, this is chockful of good information about going there – good tips. What a neat place to visit. 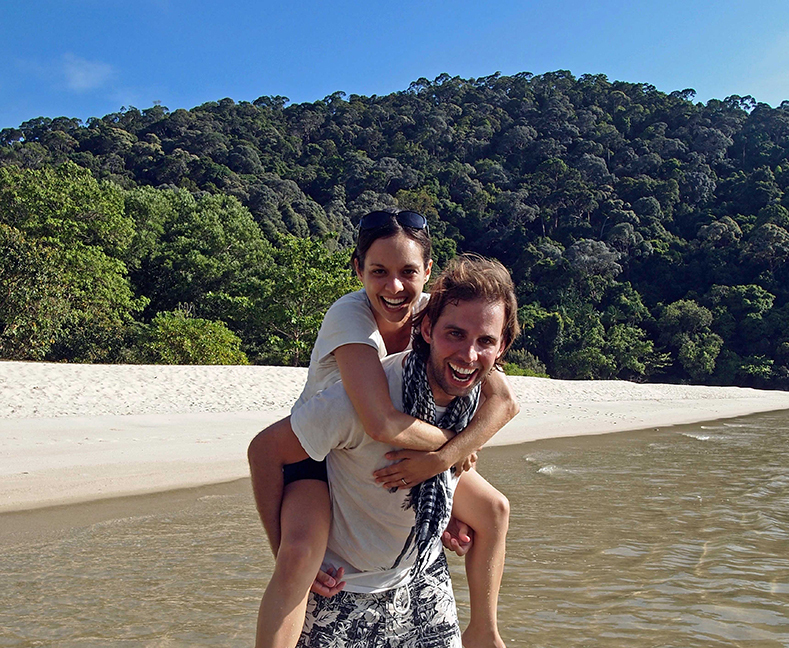 Myanmar has been on my list – this gives me extra umph to go! Thanks Raul, we had a great time. Definitely recommend going soon though. I have so much respect for your honesty about Kyaiktiyo; sadly we didn’t get to visit Hpa-an so I can’t compare. We encountered SO many issues on our ‘daytrip’ to the golden rock from Yangon, the biggest of which is that we ended up having to stay overnight with nor even a toothbrush! But I don’t regret going one bit – yes, the golden rock was, well, just a big golden rock, and a bit underwhelming, but the hilarious journey and the night we had afterwards made it worth it. Hope you don’t mind me sharing my experience – our recollections of the up-hill transport are strikingly similar!